François Quesnay (French: ; June 4, 1694 – December 16, 1774) was a French economist of the Physiocratic school. He is known for publishing the "Tableau économique" (Economic Table) in 1758, which provided the foundations of the ideas of the Physiocrats. This was perhaps the first work to attempt to describe the workings of the economy in an analytical way, and as such can be viewed as one of the first important contributions to economic thought. His Le Despotisme de la Chine, written in 1767, describes Chinese politics and society, and his own political support for constitutional Oriental despotism. Quesnay was born at Méré near Versailles, the son of an advocate and small landed proprietor. Apprenticed at the age of sixteen to a surgeon, he soon went to Paris, studied medicine and surgery there, and, having qualified as a master-surgeon, settled down to practice at Mantes. In 1737 he was appointed perpetual secretary of the academy of surgery founded by François Gigot de la Peyronie, and became surgeon in ordinary to the king. In 1744 he graduated as a doctor of medicine; he became physician in ordinary to the king, and afterwards his first consulting physician, and was installed in the Palace of Versailles. His apartments were on the entresol, whence the Réunions de l'entresol received their name. Louis XV esteemed Quesnay highly, and used to call him his thinker; when he ennobled him he gave him for arms three flowers of the pansy (derived from pensée, in French meaning thought), with the Latin motto Propter cogitationem mentis. He now devoted himself principally to economic studies, taking no part in the court intrigues which were perpetually going on around him. 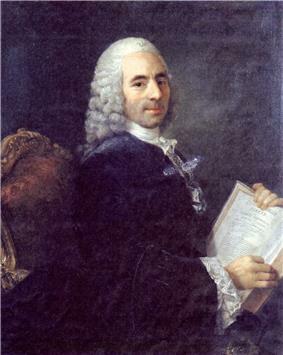 Around 1750 he became acquainted with Jean C. M. V. de Gournay (1712–1759), who was also an earnest inquirer in the economic field; and round these two distinguished men was gradually formed the philosophic sect of the Économistes, or, as for distinction's sake they were afterwards called, the Physiocrates. The most remarkable men in this group of disciples were the elder Mirabeau (author of L'Ami des hommes, 1756–60, and Philosophie rurale, 1763), Nicolas Baudeau (Introduction a la philosophie économique, 1771), G. F. Le Trosne (De l'ordre social, 1777), André Morellet (best known by his controversy with Galiani on the freedom of the grain trade during the Flour War), Mercier Larivière, and du Pont de Nemours. Adam Smith, during his stay on the continent with the young Duke of Buccleuch in 1764–1766, spent some time in Paris, where he made the acquaintance of Quesnay and some of his followers; he paid a high tribute to their scientific services in his Wealth of Nations. Quesnay married in 1718, and had a son and a daughter; his grandson by the former was a member of the first Legislative Assembly. He died on December 16, 1774, having lived long enough to see his great pupil, Anne Robert Jacques Turgot, Baron de Laune, in office as minister of finance. The publications in which Quesnay expounded his system were the following: two articles, on "Fermiers" (Farmers) and on "Grains", in the Encyclopédie of Diderot and D'Alembert (1756, 1757); a discourse on the law of nature in the Physiocratie of Dupont de Nemours (1768); Maximes générales de gouvernement economique d'un royaume agricole (1758), and the simultaneously published Tableau économique avec son explication, ou extrait des économies royales de Sully (with the celebrated motto, Pauvres paysans, pauvre royaume; pauvre royaume, pauvre roi); Dialogue sur le commerce et les travaux des artisans; and other minor pieces. Quesnay is known for his writings on Chinese politics and society. His book Le Despotisme de la Chine, written in 1767, describes his views of the Chinese imperial system. He was supportive of the meritocratic concept of giving scholars political power, without the cumbersome aristocracy that characterized French politics, and the importance of agriculture to the welfare of a nation. The phrase laissez-faire, coined by fellow Physiocrat Vincent de Gournay, is postulated to have come from Quesnay's writings on China. Gregory Blue writes that Quesnay "praised China as a constitutional despotism and openly advocated the adoption of Chinese institutions, including a stardardized system of taxation and universal education." Blue speculates that this may have influenced the 1793 establishment of the Permanent Settlement in Bengal by the British Empire. Quesnay's interests in Orientalism has also been a source of criticism. Carol Blum, in her book Strength in Numbers on 18th century France, labels Quesnay an "apologist for Oriental despotism." Because of his admiration of Confucianism, Quesnay followers bestowed him with the title "Confucius of Europe." Quesnay's infatuation for Chinese culture, as described by Jesuits, led him to persuade the son of Louis XV to mirror the "plowing of sacred land" by the Chinese emperor to symbolize the link between government and agriculture. ^ Cutler J. Cleveland, "Biophysical economics", Encyclopedia of Earth, Last updated: September 14, 2006. ^ a b c Ina Baghdiantz McCabe (15 July 2008). Orientalism in Early Modern France: Eurasian Trade, Exoticism and the Ancien Regime. 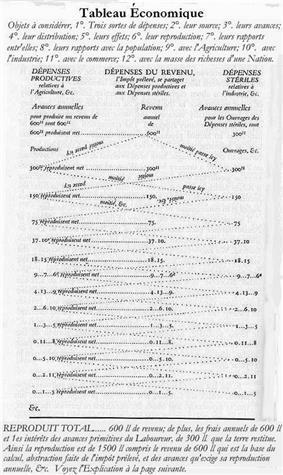 ^ "Nouvelles Ephemerides, Économiques, Seconde Partie, Analyses, Et Critiques Raisonnées. N° Premier. Éloge Historique De M. Quesnay, Contenant L'Analyse De Ses Ouvrages, Par M. Le Cte D'A***". Taieb.net. Retrieved 2012-08-16. ^ Phillip Anthony O'Hara (1999). Encyclopedia of Political Economy. Psychology Press. p. 848. ^ E. S. Shaffer (30 November 2000). Comparative Criticism: Volume 22, East and West: Comparative Perspectives. ^ Carol Blum (5 February 2002). Strength in Numbers: Population, Reproduction, and Power in Eighteenth-Century France. ^ Geoffrey C. Gunn (2003). First Globalization: The Eurasian Exchange, 1500 to 1800. Hobson, John M. (2004), The Eastern Origins of Western Civilization, Cambridge University Press, .